Termicide’s dedication to provide the best possible termite solutions to builders and their customers is why we have established ourselves as market leaders in the termite industry. Our products have won numerous Mayors’ innovation awards and Good Environmental Choice Australia has rated The Termiglass System as the best possible termite barrier available based on Environmental Attributes. 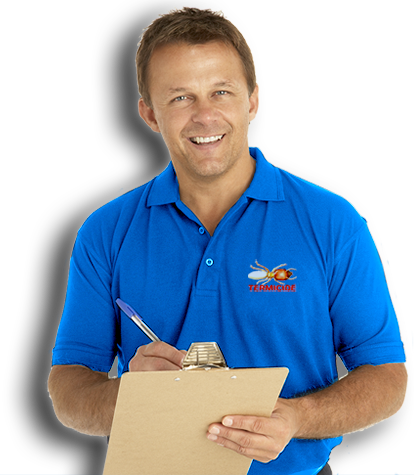 No other company can offer such an effective user friendly termite management system at competitive rates while maintaining such a high level of service. Deal direct with the Manufacturer and cut out the middle man Supply fit and install all under the one roof ensures maximum savings and personalised service. Our no quibble policy and builder friendly termite barriers are why when a builder starts with Termicide they stay with Termicide. Full time staff and monthly training meetings are standard with Termicide. Our team of supervisors are always on hand to help answer any application questions and ensure we maintain the high standard expected by our builders Guaranteed piece of mind. The easy application of the Termiglass system means we fit into the construction process rather than expect other trades to wait for us. Once your trades are on site they stay on site saving time money and headaches. There is a 25 mm relaxation height between the Termiglass barrier and the finished path heights reducing steps in and out of doorways is sometimes advantageous. If you pour concrete above the termite barrier e.g. driveways and wheelchair access ramps you do not need to call us every time you pour. Our secondary barrier goes in after the concrete. Simply call us before handover and all areas that require treating are done with one phone call very builder friendly. All Certificates and stickers are supplied on time every time. Termiglass has just received the Environmental Choice Tick and has rated No. 1 as the most environmentally friendly termite barrier available. Important as the 5 star provisions loom. All Termicide products comply to A/S 3660.1.